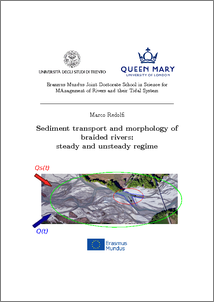 Redolfi, Marco (2014) Sediment transport and morphology of braided rivers: steady and unsteady regime. PhD thesis, University of Trento, Queen Mary University of London. Braided rivers are complex, fascinating fluvial pattern, which represent the natural state of many gravel and sand bed rivers. Both natural and human causes may force a change in the boundary conditions, and consequently impact the river functionality. Detailed knowledge on the consequent morphological response is important in order to define management strategies which combine different needs, from protection of human activities and infrastructures to preservation of the ecological and biological richness. During the last decades, research has made significant advance to the description of this complex system, thanks to flume investigations, development of new survey techniques and, to a lesser extent, numerical and analytical solutions of mathematical models (e.g. Ashmore_2013). Despite that, many relevant questions, concerning the braided morphodynamics at different spatial and temporal scales (from the unit process scale, to the reach scale, and eventually to the catchment scale) remain unanswered. For example, quantitative analysis of the morphological response to varying external controls still requires investigation and needs the definition of suitable, stage-independent braiding indicators. In addition, the morphodynamics of the fundamental processes, such as bifurcations, also needs further analysis of the driving mechanisms. General aim of the present study is to develop new methods to exploit, in an integrated way, the potential of the new possibilities offered by advanced monitoring techniques, laboratory models, numerical schemes and analytical solutions. The final goal is to fill some gaps in the present knowledge, which could ultimately provide scientific support to river management policies. We adopted analytical perturbation approaches to solve the two-dimensional shallow water model; we performed laboratory simulations on a large, mobile-bed flume; we analysed existing topographic measurements from LiDAR and Terrestrial Laser scanning Devices; and we simulated numerically the river hydrodynamics. Within each of the six, independent, research chapters, we interconnected results from the different approaches and methodologies, in order to take advantage of their potential. Summarising, the more relevant and novel outcomes of the present work can be listed as follows: 1) We explored the morphological changes during a sequence of flood events in a natural braided river (Rees River, NZ)and we proposed a morphological method to assess the sediment transport rate. In particular we propose a semi-automatic method for estimating the particles path-length (Ashmore and Church, 1998) on the basis of the size of the deposition patches, which can be identified on the basis of DEM of differences. Comparison with results of numerical simulation confirmed that such an approach can reproduce the response of the bedload rate to floods of different duration and magnitude. 2) We developed a new indicator of the reach-scale morphology and, on the basis of existing laboratory experiments, we explored its dependence, under regime conditions, to the controlling factors: slope, discharge, confinement width, grain size. In spite of its synthetic nature, this simple indicator embeds the information needed to estimate the variability of the Shield stress throughout the braided network, and consequently enables to assess the transport-rate and its variation with the driving discharge. 3) We investigated, through flume experiments, the effect of the flow unsteadiness on the sediment transport in a braided river. This is possible only by following a statistical approach based on multiple repetitions of the same flow hydrograph. Results revealed that for confined network an hysteresis of the bedload response occurs, which leads to higher sediment transport during increasing flow, whereas relatively unconfined networks always show quasi-equilibrium transport rates. 4) A second set of laboratory experiments provided information on the morphodynamics of a braided network subject to variations of the sediment supply. We proposed a simple diffusive model to quantify the evolution of the one-dimensional bed elevation profile. Such simple approach, albeit having a limited range of practical applications, represents the first attempt to quantify this process and enables to study the relevant temporal and spatial scales of the phenomenon. 5) We solved analytically the two-dimensional morphodynamic model for a gravel-bed river bifurcation. This furnishes a rigorous proof to the idea proposed by Bertoldi and Tubino (2007) to interpret the morphological response of bifurcation in light of the theory of the morphodynamic influence. The analytical approach enables to investigate the fundamental mechanics which leads to balance, and unbalance, configurations and, from a more practical point of view, allows for a better prediction of the instability point than the existing 1D models (e.g. Bolla Pittaluga et al., 2003).